*Six Months Synchrony 0% No Interest Financing, Equal Monthly Pay. Transaction Code: 106. Apply online at: Capitol Synchrony Bank Equal Monthly Pay Financing. Synchrony will advise you of your maximum amount of credit that you can use towards purchase. In order to provide beautiful seams and outstanding feed performance, JUKI adopted box feed system. The conventional feed mechanism is oval motion. On the other hand, the box feed moves the feed dog in a box motion. This eliminates material shrinking and shifting. This accurate feeding system provides superior stitch quality for a variety of light to heavy weight fabrics. No fabric shrinkage even sewing on extra light weight materials. Thick handle can be sewn with ease. HZL-G series has powerful feeding thanks to the improved presser foot construction. Heavy material projects, such as hemming denim jeans, can be sewn with ease! 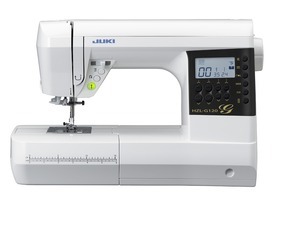 HZL-G series sews beautiful buttonholes regardless of the type of material. 8 types of buttonholes are available for your needs. The Automatic Needle Threader easily threads the needle without eyestrain and allows you to start sewing quickly.